We are very pleased to be re-releasing our poster series, encouraging readers young and old to consider a different kind of hero than we normally think of when reading comics. 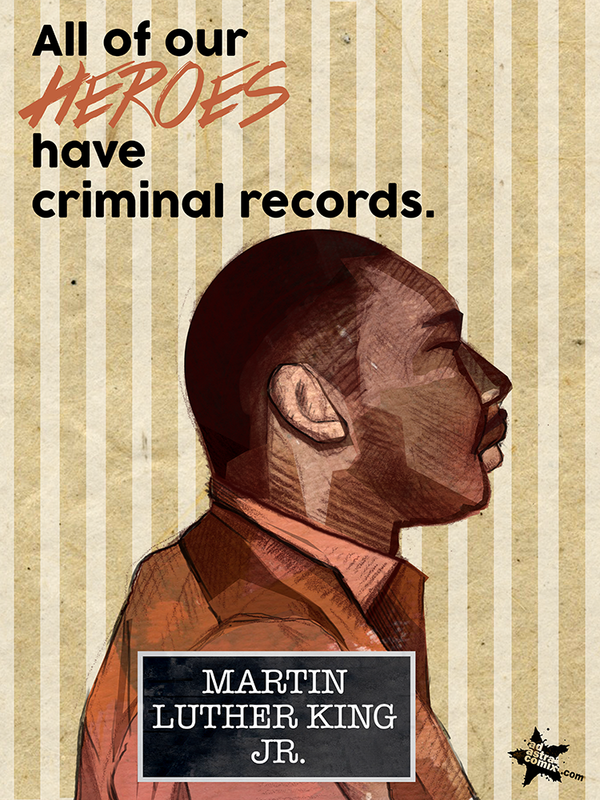 These four posters boldly claim, “All Our HEROES Have Criminal Records“. 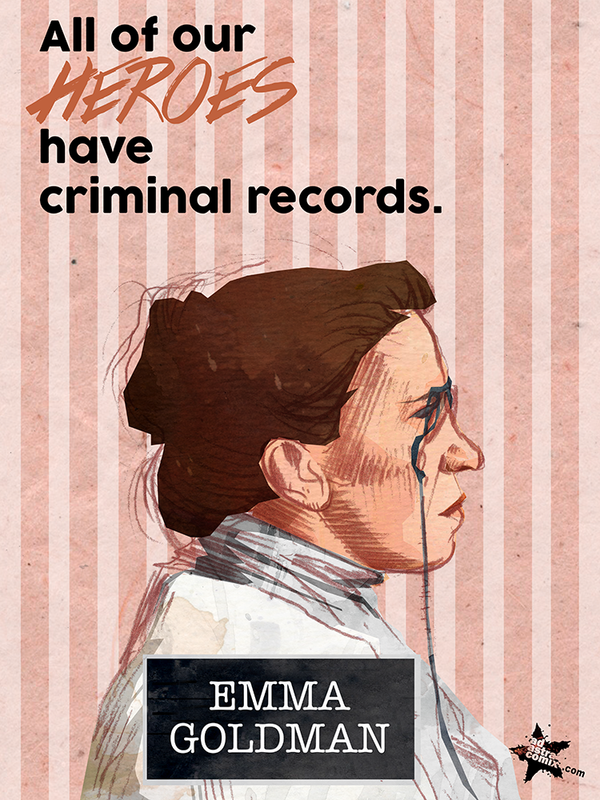 This visual campaign is inspired by the lives of four people who have been arrested for their grassroots organizing and/or activities of civil disobedience: Martin Luther King, Jr., Howard Zinn, Emma Goldman, and Judi Bari. They reflect a healthy variety of political backgrounds (civil rights, environmentalism, anti-war, people’s history, feminism, and anarchism) – and each has appeared, at least once, in comic form. All artwork by Sean Richman. We’re excited to be making these posters available for sale! Visit the Ad Astra Online Shop to get your favorite, or collect all four. Numbers are limited for this printing, so if you don’t get one – stay tuned! Goldman was an anarchist and feminist known for her political activism, writing, and speeches. She played a pivotal role in the development of anarchist political philosophy in North America and Europe in the first half of the 20th century. Arrested in 1917 with Alexander Berkman for conspiring to “induce persons not to register” for the newly instated WWI military draft. 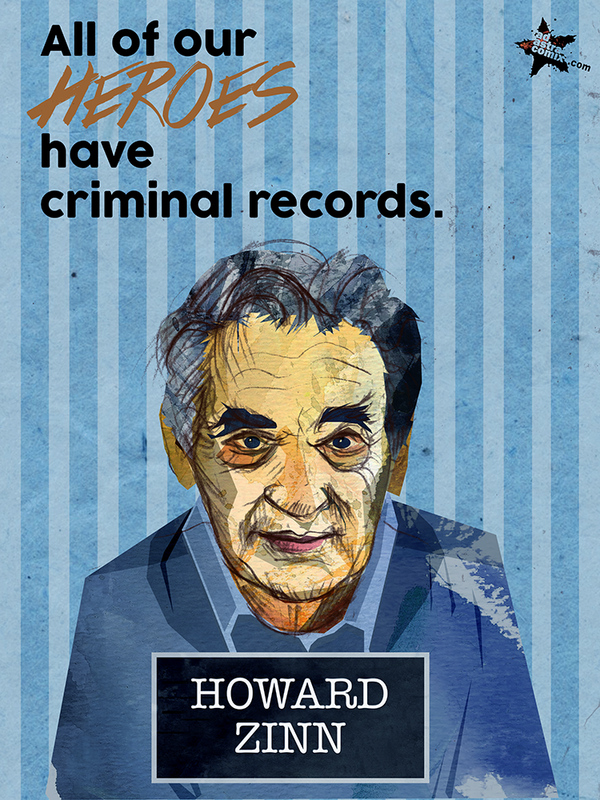 HOWARD ZINN was an historian, author, activist, WWII veteran, and commentator on American politics and history. By the end of the 1960s, as a result of Zinn’s campaigning against the Vietnam War and his influence on Martin Luther King, Jr., the FBI designated Zinn a high security risk to the country, a category that allowed them to summarily arrest him if a state of emergency were to be declared. The FBI memos also show that they were concerned with Zinn’s repeated criticism of the FBI for failing to protect blacks against white mob violence. Zinn’s daughter said she was not surprised by the files; “He always knew they had a file on him”. — with Howard Zinn. Howard Zinn appears in A People’s History of American Empire: The Graphic Adaptation, by Howard Zinn, Mike Konopacki and Paul Buhle. It was published by Metropolitan Books in 2008 (ISBN#: 978-0805087444). 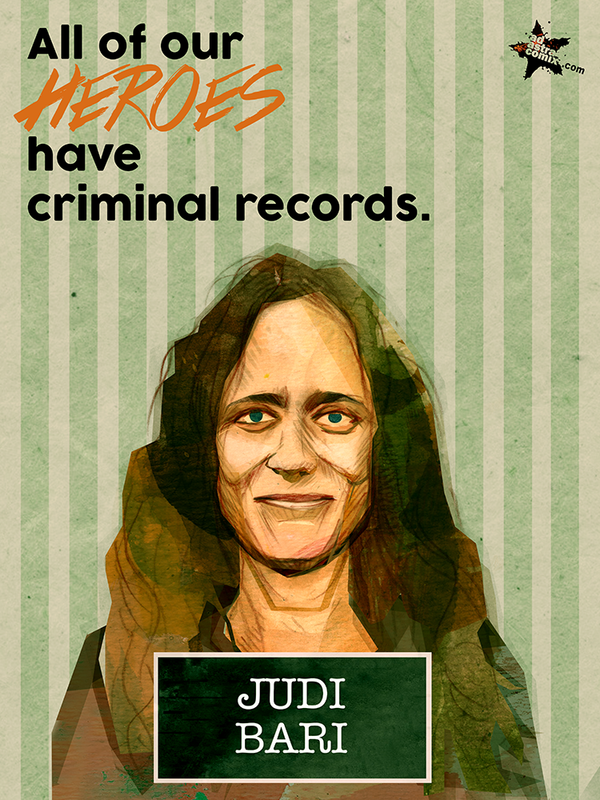 JUDI BARI was an American environmentalist and labor leader, a feminist, and the principal organizer of Earth First! campaigns against logging in the ancient redwood forests of Northern California in the 1980s and ’90s. She also organized efforts through Earth First! – Industrial Workers of the World Local 1 to bring timber workers and environmentalists together in common cause. On 24 May 1990, in Oakland, California, the vehicle used by Bari and Darryl Cherney was blown up by a pipe bomb planted in it. Bari was severely injured by the blast, as the bomb had been placed under her seat; Cherney suffered minor injuries. Bari was falsely arrested for transporting explosives while she was still in critical condition with a smashed pelvis and other major injuries. The FBI took jurisdiction of the case away from the Bureau of Alcohol, Tobacco, Firearms and Explosives, saying it was a terrorism case. Judi Bari’s story appears in WOBBLIES! : A Graphic History of the Industrial Workers of the World by Mike Alewitz, Sue Coe, Sabrina Jones, Paul Buhle and Nicole Schulman. It was published by Verso Books in 2005. MLK was an American pastor, activist, humanitarian, and leader in the African-American Civil Rights Movement. He is best known for his role in the advancement of civil rights using nonviolent civil disobedience based on his Christian beliefs. Arrested in 1962, 1963, and 1965 while demonstrating for civil rights in the American South. The story of Martin Luther King Jr. can be found in many titles at this time. The first appeared in 1958, called Martin Luther King and the Montgomery Story (written by Alfred Hassler and Benton Resnik, produced by the Fellowship of Reconciliation) , and has been re-released by Top Shelf Productions. Another is KING, a three-part biography by Ho Che Anderson, published by Fantagraphics between 2003-2005.